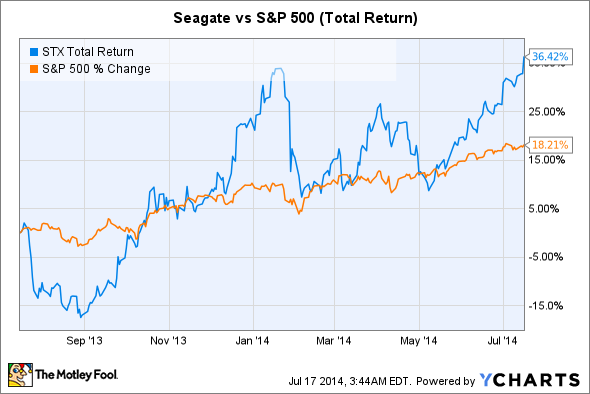 Seagate is one tech stock that pays a solid dividend. It's rare to find a tech stock that pays a solid dividend. Many don't pay a dividend at all, and those that do rarely offer anything substantial. But Seagate (NASDAQ:STX) is an exception. At current levels, it's yielding more than 3% -- far better than rivals like Western Digital (NASDAQ:WDC) and SanDisk (UNKNOWN:SNDK.DL). Although tech stocks are often seen as antithetical to value investing, Seagate is, in many ways, a value investors' dream. In addition to paying out a steady string of dividends, Seagate trades with a below-market multiple. It's also buying back shares -- last quarter, Seagate purchased $184 million of its stock, and had said it plans to purchase a similar amount this quarter. Seagate generates cash -- last quarter, it produced free cash flow of about $319 million. That was less than half of what it generated in the prior quarter, but Seagate blamed the decline on largely temporary factors. Although Seagate's capital return program looks solid for the time being, investors should get more insight when the company reports earnings on Thursday. At any rate, Seagate certainly offers better value than its competitors. Both Western Digital and SanDisk pay a dividend, but yield a paltry 1.70% and 0.90%, respectively. They also trade with much higher multiples, far greater than the market. But those high multiples seem to be based on the two firms relative exposure to the booming flash memory market -- an alternative storage solution that competes with Seagate's products. Although Seagate does offer some solid-state drives, it still primarily relies on traditional hard drives. Those drives still ship in most PCs, and are deployed heavily by enterprise customers, but have seen virtually no adoption in the mobile market (smartphones and tablets). Shares of SanDisk plummeted in after-hours trading on Wednesday after a reported a quarter that was only slightly better than analysts had expected (with its excessively high multiple, investors were apparently looking for an equally impressive earnings beat). But SanDisk's disappointing results weren't due to a lack of demand -- the company had a difficult time keeping up with the market, and found itself supply constrained. Like Seagate, the vast majority of Western Digital's revenues still come from traditional hard drives, but the company has been targeting the flash memory market for growth, and Western Digital's flash segment has seen significant growth in recent quarters. Is Seagate's business built to last? But value investing entails one other major component: seeking out stable, predictable businesses. In recent years, that's definitely been the case for Seagate, though some are skeptical that it can continue. Famed short seller Jim Chanos targeted Seagate last year, arguing that the decline of the traditional PC, coupled with the rise of flash memory, made Seagate a value trap. Though it may pay a solid dividend and appear cheap, Seagate's business was facing a significant decline as the market for its products gradually went away. So far, Chanos has been dead wrong -- on a total return basis, Seagate has trounced the broader market over the last year, delivering a return of more than 35%. The market for traditional PCs appears to be healthy, at least for the time being, and PC-related firms have done extraordinarily well as of late. Still, Chanos could be right in the long run. Seagate's cheap, but it's cheap for a reason. But as long as it continue to generate significant cash flow, this is one tech stock dividend investors can look to for income.